Table-top views of two of the Apollo 17 lunar orbital experiments. 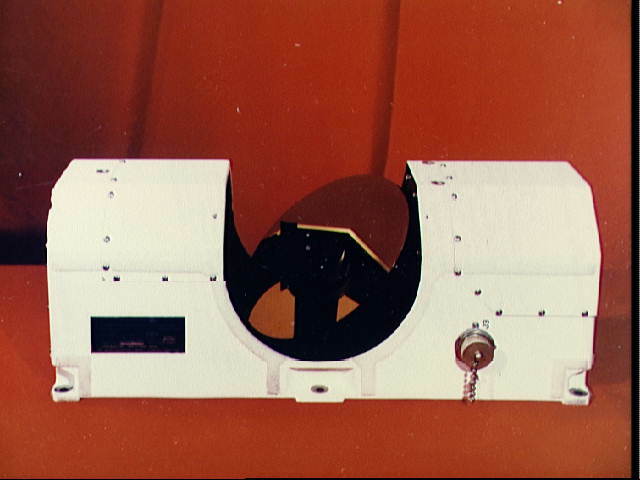 Views include the the Far-Ultraviolet Spectrometer, Experiment S-169, one of the lunar orbital science experiments which will be mounted in the SIM bay of the Apollo 17 Service Module. Atomic composition, density and scale height for several contituents of the lunar atmosphere will be measured by the experiment. Solar far-UV radiation reflected from the lunar surface as well as UV radiation emitted by galactic sources also will be detected (53470); The Infrared Scanning Radiometer (ISR), Experiment S-171, which will be mounted in the SIM bay of the Service Module. The ISR experiment will provide a lunar surface temperature map with improved temperature and spatial resolution over what has been possible before (53471).